Uranus spins on its side! 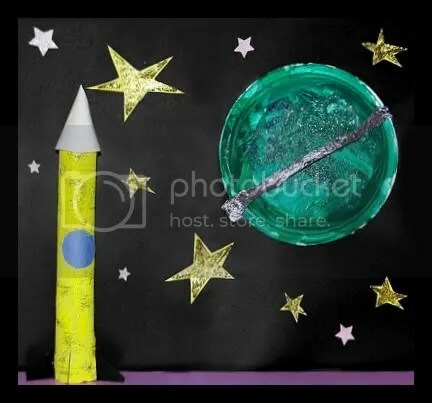 International Space Day was at the yesterday, and while T and I were discussing all the wonderful aspects of our universe (again), I remembered this fun and simple project that we made waaaaaaay back in March to celebrate the discovery of Uranus (go on, giggle – I know you want to. Uranus is my favorite planet, too). I wanted to post it before it gets lost in the endless archives that are my computer, and so – here it is! This is a VERY easy craft to do, paint a paper plate planet, scrunch up some aluminum foil for a ring (there are prolly better ways to make a ring, but T wanted a SILVER ring for some random toddlerish reason), paint a paper-towel roll for a rocket ship with construction paper embellishments,construction paper stars, and a healthy sprinkling of the sparkly stuff all over! Teaball, like most little kids (I think), is totally enamored with the idea of outer space. Thoughts of astronauts flying in rocket-ships and floating around with stars is enough to capture anyone’s imagination! I’m not really sure how much T actually understands. . . the endlessness of our universe is a tough concept for ME to grasp, much less a toddler with an extremely limited world view (as in, the playground is sooooo far away at 5 minutes down the road). Though I can’t actually say what is going on in her little brain, she IS doing extremely well (for a 2-year-old) with learning her planets! This isn’t entirely my doing, in fact, I have Blue and Steve to thank for this bit of luck. They’ve really been a huge help in these lessons! 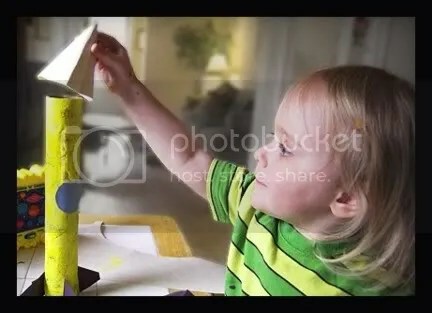 Do you see the yellow toy that’s sitting on the table in the pictures above? That’s T’s “Skidoo and Learn” Blue’s Clues space game. It plays the planet song from the show (season 2, episode 4: What Experiment Does Blue Want To Try? ), and then prompts the child to press the correct planet for the clue given. Its outdated, of course, Pluto has been stripped of the illustrious title of ‘planet’ since this toy was made, but it serves its purpose just fine for us – and its FUN! T has had the thing since her 2nd birthday, and has always had fun making it play the song and pushing random buttons. But recently, T has been starting to actually listen to toys that speak to her and respond by doing what they ask (creepy…). So when this one says “can you find the brightest planet?” T will (usually) try to find the Venus button (if I don’t actually want her to do so at the time). Very neat. 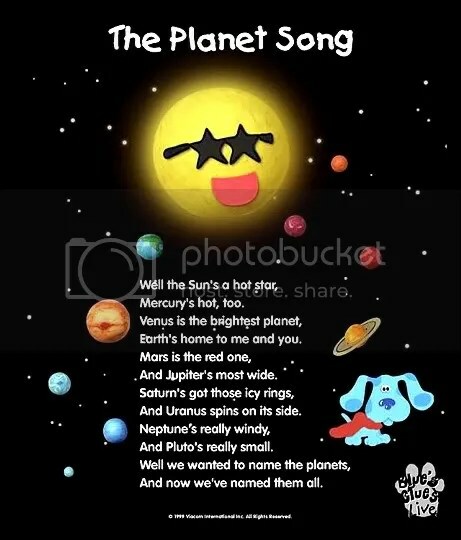 . .
you'll have to scroll to the bottom for the Planet song! In another great Blue’s Clues episode for learning about all things spacey (Blue’s Pajama Party – episode 6 of season 3), Blue and Steve “Skidoo” to outer space and have a talk with Sun and Earth about why we have night-time. It is explained to them that the Sun is always shining, but because the earth is always spinning, parts of it are in a shadow, away from the Sun’s light, thus causing night. Both of these Blue’s Clues shows have really helped T to start to get a basic idea of whats going on out there in our world, and I think it will prove to be a wonderful base for future learning! Awesome educational experiences are abundant in your home!! Way to go mom! I was just surprised when Nola started talking about constellations. Thanks to Moose & Zee as well as Dora. That Noggin really is like pre-school on TV!!! 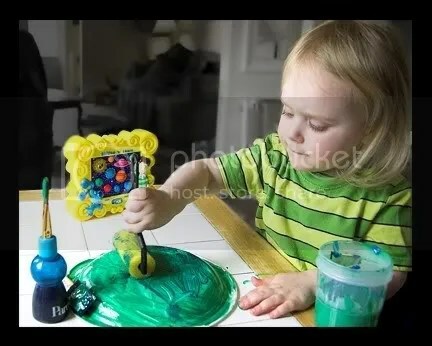 Silly lady – she doesn’t actually KNOW them all yet – she’s just doing great for a 2-year old! Yours are, too – I’m sure! THEY know all about the pajama-nauts, neh? Really, at this point, I’m totally psyched that she even knows what planets ARE, lol! I’ll keep this in mind if Tommy has to do a school project about space.